Our Windows Phone app updates continue! 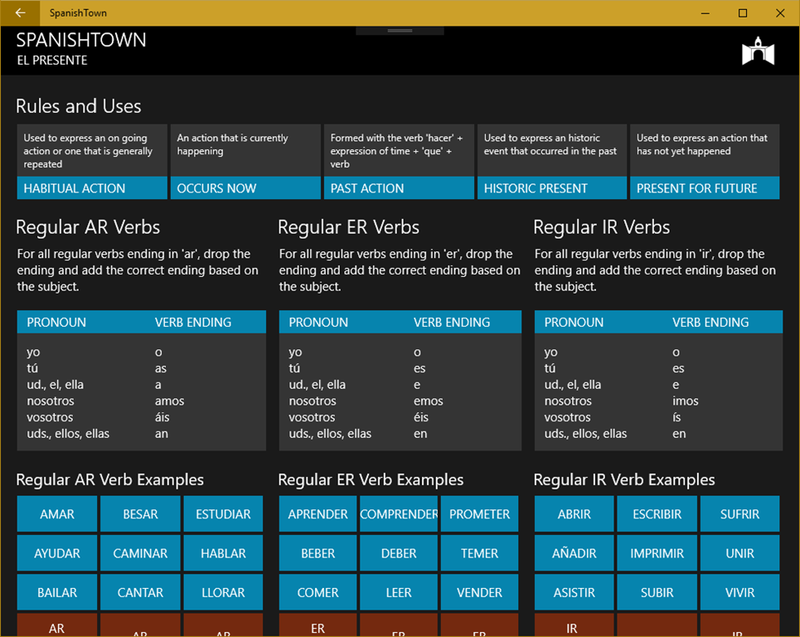 The present tense app has now been updated with an improved look, an easier flow and practice quizzes. We’ve added 145 questions over 6 different practice quizzes to test your knowledge and help you prepare for you next exam. After giving the app away for more than 2 years we have decided that the time has come to generate a little revenue to support our developers and pay them back for all of their hard work over the years. Our first 3 apps to receive major updates for Windows Phone 8 are now live! The updates are exclusive to Windows Phone 8. Do you place an ‘O’ on the end of an English word hoping to make it Spanish? Do you only know "Dos cervezas por favor."? Do you pronounce the "h" in "hola"? Do you believe that in Mexico they speak "Mexican"? Sorry but you must be a Spanish Noob. Don’t worry though! 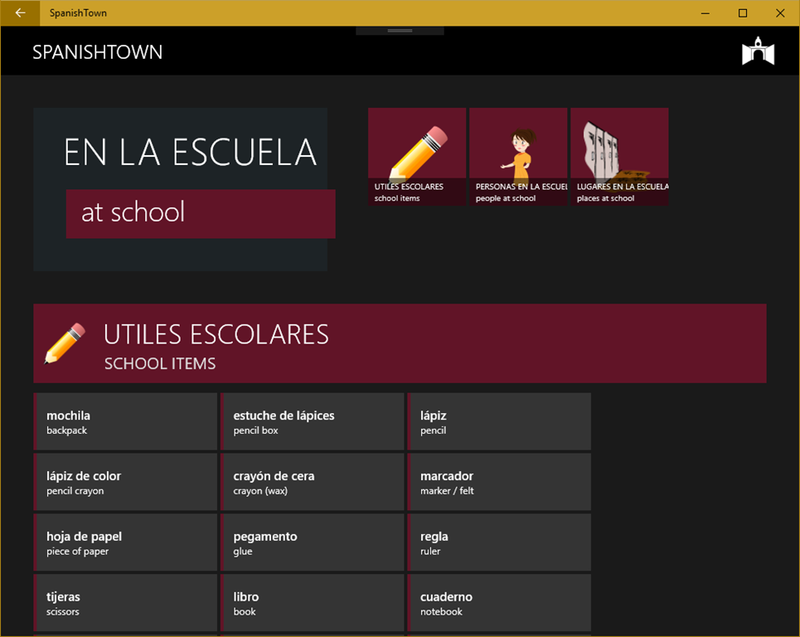 Our Spanish for Noobs Windows Phone App is here. Start at the very beginning by picking up some basic vocabulary and phrases. 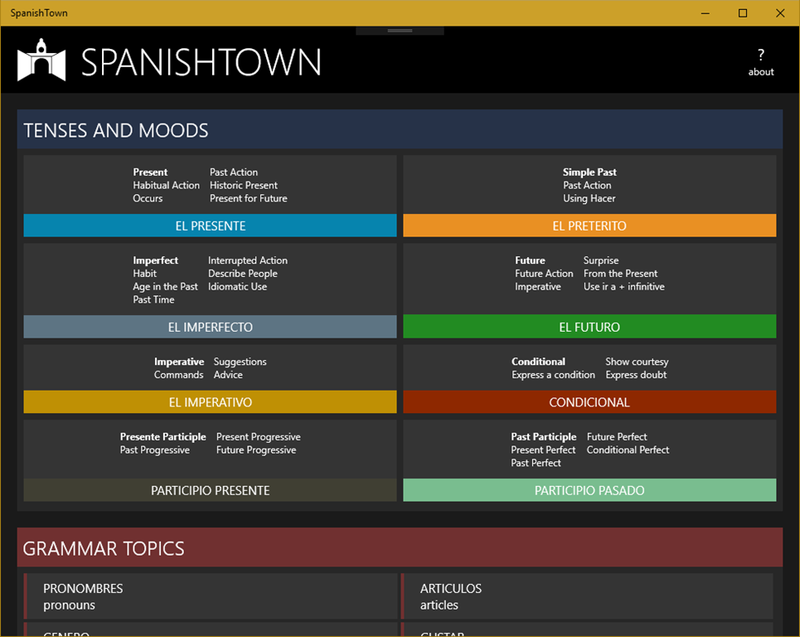 When you’re ready read up on some introductory Spanish grammar for beginners. In no time you’ll be watching Colombian Telenovelas! The Spanish Grammar Preterite and Imperfect Tenses app is designed for students learning the Spanish language, specifically the simple past tense. It provides students with a quick and easy reference to the rules, exceptions and uses of the simple past tense. 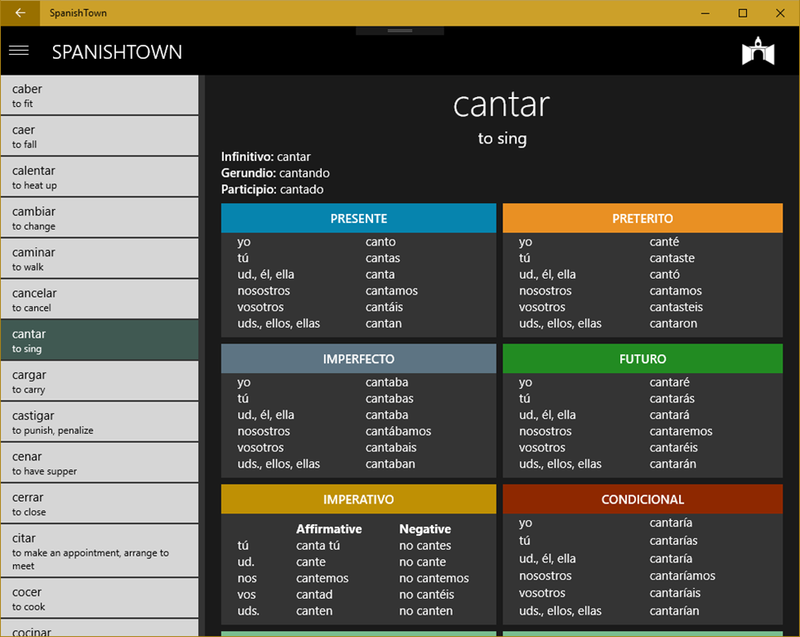 Essentially it is a cheat sheet for your Windows Phone. It provides you with sample regular and irregular verbs along with their English translation and their past tense conjugation. Includes 110 quiz questions over 6 different quizzes to test your knowledge and help you prepare for class. 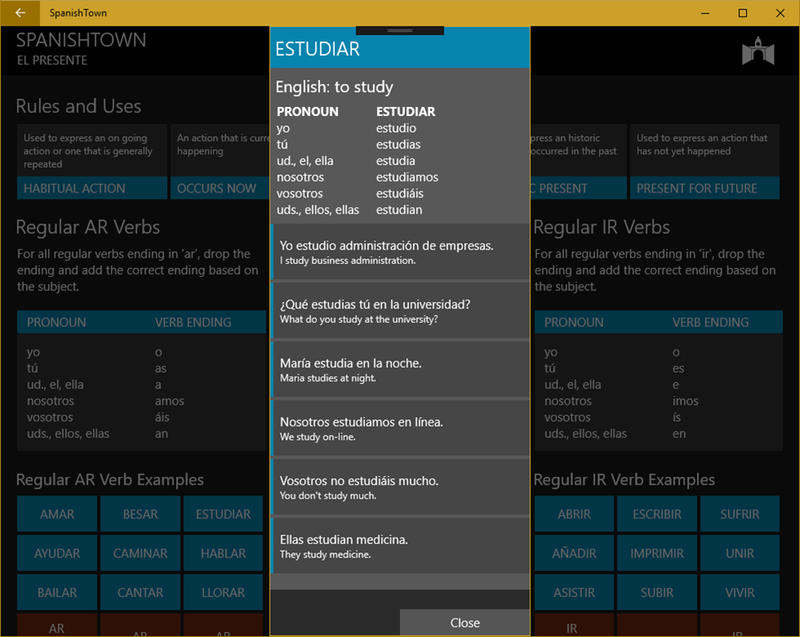 The verb list contains over 340 common Spanish verbs, with their English translation and their preterite and imperfect tense forms build right into the app. Improve your Spanish! Download our Spanish Future Tense app to learn the rules and uses of the future tense. Designed for students to use a reference tool, our comprehensive list of over 340 common verbs will help you achieve success in your Spanish class. 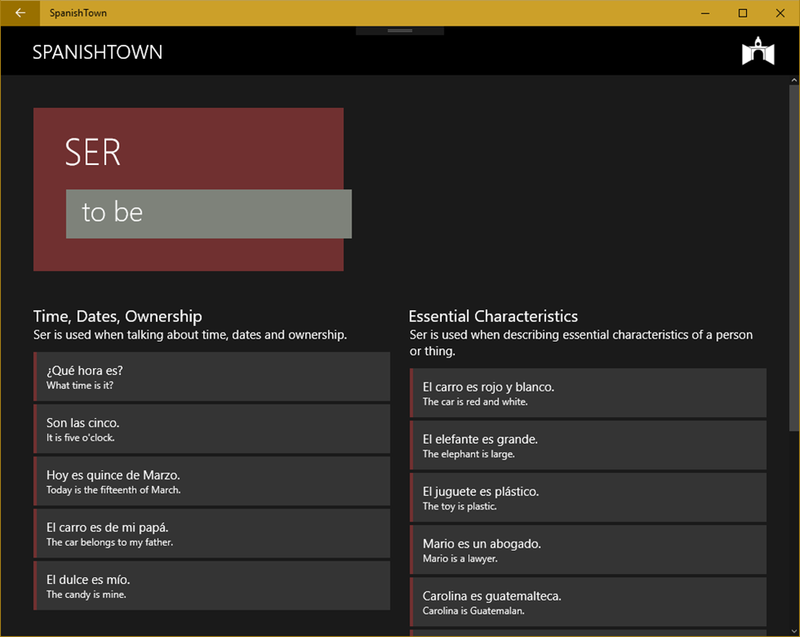 Version 2.0 for Windows Phone 8 includes a new design and 100 questions over 5 different quizzes to help you prepare for your next exam. It is a great tool to use when working on your homework assignments. The app is simple to navigate and easy to understand.